The “Shawl” is a wearable art, painted silk, open front cape-like wrap that has kimono sleeves (variable length). This piece includes a magnetic “button” pin which allows for multiple methods of draping and wear. The length varies from 42″ and is approximately 48″ from shoulder to hem. Each design is unique. Exact replication is not possible, however, every attempt will be made to replicate similar colors, designs, and shape. 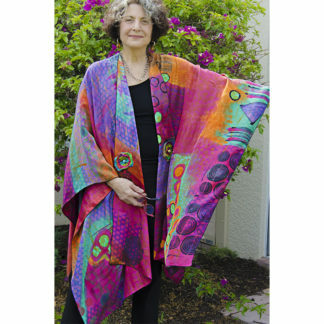 Shawls are hand painted and handmade in the United States.